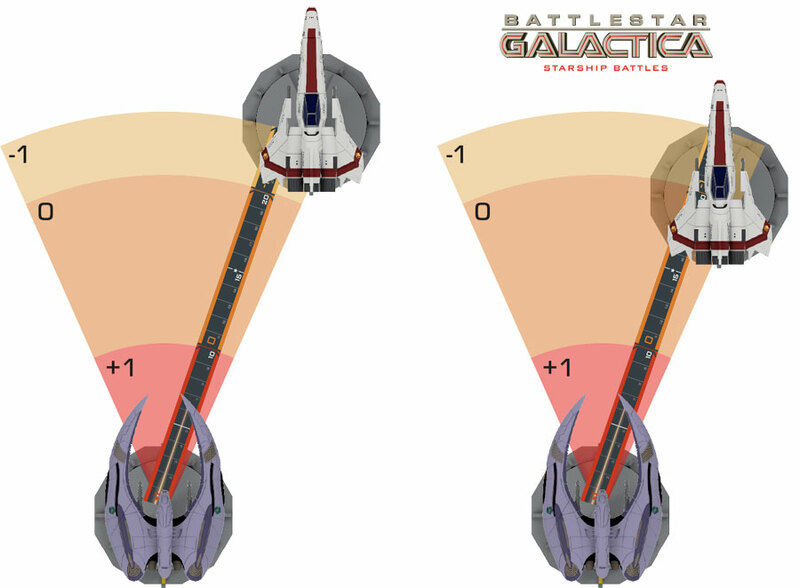 In the previous articles, we presented an outline of the Battlestar Galactica - Starship Battles game and started to talk about the game mechanics of the movement system. Now, let’s learn more about the combat system, explained by Andrea Mainini, co-author of the game with Andrea Angiolino. The combat system plays a crucial role in the game mechanics, and Andrea Angiolino and I developed it with the goal of integrating the typical features of Wings of Glory and Sails of Glory with the specific ingredients of the space setting. 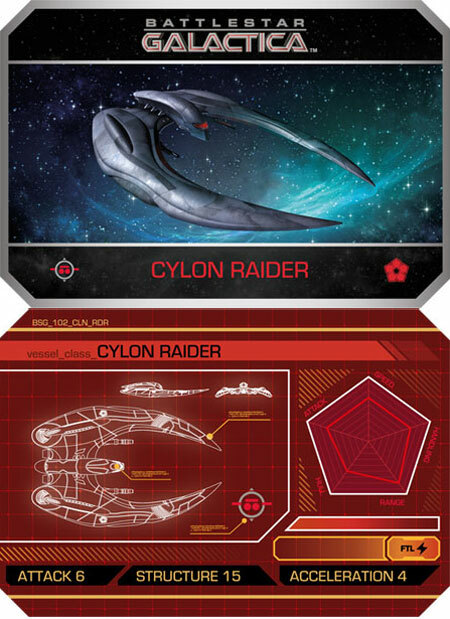 The result is an original system that allows you to effectively simulate the intense and special space combat of the Battlestar Galactica universe. As with movement, a simplified version of the combat system can be used when playing the Quick Start Rules and a more advanced version when playing with the Complete Rules. Using the Quick Start Rules, after a single movement phase, it is time to fight and fire! Spaceship cards show the key stats of each craft. The combat system is simple and immediate with shooting arcs shown directly on the base of each spaceship, and range by using the combat ruler. The combat ruler, in fact, clearly indicates the different shooting ranges and the relative modifiers. If you decide to play with the optional rules that take into account the three-dimensionality of space, it works like a real "calculator" to determine the effective distance between two spaceships at different levels. First of all, you check if one or more opposing spaceships are in your spaceship’s attack range - framed in the firing arc of the spaceship and within a suitable distance, determined with the proper combat ruler. Then, you throw 2 normal 6-sided dice to verify that the spaceship has been hit (you must equal or exceed a numerical value linked to the firing spaceship, possibly modified by the distance of the opposing spacecraft; for this reason, the ruler is divided into three zones: short range, medium range, and long range). Finally, if the shot has been scored, numerical counters are drawn to determine the extent of the damage. Each spaceship has a given structural resistance to damage and, once the accumulated damage equals or exceeds its resistance, the spaceship is eliminated. Using the Complete Rules, the combat phase is more intricate and rich in variables, which increase the realist effect of the simulation while maintaining maximum playability. Two examples of combat, showing the firing arc and the range, determined with the combat ruler. First of all, the game turn is divided into two phases of movement and fire, instead of one. You have the tactical choice to decide in which of the two fire phases to shoot (you cannot shoot in both). In addition, the speed of the attacking spacecraft and the "target" spacecraft affect shooting accuracy. In the event of a hit, the spaceship is the subject of several types of special damage that have different effects on its future actions. Wings of Glory and Sails of Glory fans might be amazed at the choice to insert the die roll, which is not present in the combat system of the Starship Battles’ "predecessors." Beginning with the early stages of development, we realized using the die allowed us to include a simpler and more linear way to differentiate offensive capabilities related to ships and pilots, as well as the typical modifiers of space combat, such as speed of attacker and defender - and anyway, let's face it, rolling the dice is always fun! As in the best tradition of Wings of Glory and Sails of Glory, there are also numerous optional rules that introduce additional tactical factors to be taken into account. They can be added at players’ discretion to make the simulation even more detailed, complete, and satisfying, even for more demanding and picky players. In the next article, find out more interesting information about other gameplay elements.